El Centro D.F. or "the center" opened in May 2011 as yet another notable restaurant in the U Street Corridor/Logan Circle area. It is one of nearly 20 restaurants nationwide opened by acclaimed Executive Chef Richard Sandoval, but only the 3rd in DC so it is easy to understand why there was so much excitement about this one. As a regular patron to one of his other restaurants, Masa 14, I was expecting a similar vibe, but it actually quite different. El Centro is a much larger restaurant than anyone would imagine by just seeing its facade from the street as there are actually several floors. The bottom floor is the Tequileria, which is the main dining room; the street-level floor is the Taqueria, which is the casual dining area; and the rooftop houses two open-air bars. When Zach and I walked in, we stated we wanted a table for two and they immediately walked us downstairs to the Tequileria. The Tequileria is actually in the basement of this building. It is an interesting and unique decor of stone walls and warm lights. 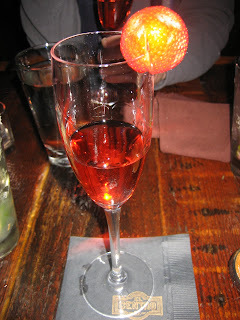 When we started looking at the drink menu, I was completely overwhelmed. There were over 200 Tequilas and Mezcals! I'm not much into tequila so I didn't know where to start. I eventually went with the Lavanda, which was Milagro Blanco, St. Germain, lavender simple syrup, and lime. It sounded great, but when I tasted it, it wasn't very good. It was way too watered down. 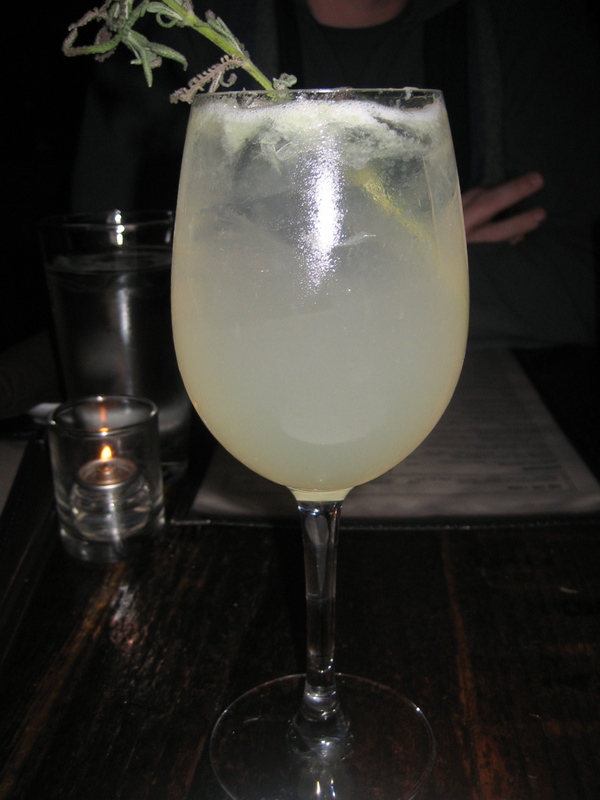 I returned it and ordered the El Centro Margarita instead with Don Julio 70 tequila, lime, and agave nectar. Now this was one of the best margaritas I've ever had. Very good! El Centro does not have many vegan options, but the few that they had sounded good and when I got in touch with Chef Juan Romero ahead of time, he sounded very willing to accommodate. We started off with the Mushroom Huaraches, which is a corn masa flat bread with bean puree, sauteed mushrooms with epazote, roasted corn, and a pinch of cilantro. Truffle oil is drizzled across the huaraches as well. This dish usually has cheese, but, obviously, I asked them to hold that. Although I enjoyed the huaraches, they tasted like they were missing something - like the cheese should have been replaced with vegan cheese. The truffle oil didn't pair well with the dish either. I just felt like something should have been different. For the main course, I ordered the Grilled Nopal (cactus) tacos. If you've never had grilled cactus before, I highly recommend giving it a try. These tacos, while messy and oily were pretty good. They each had cactus, vegetables, chayote, salsa roja, corn, onion and tomato. Again, I asked them to hold the cheese. The tacos weren't quite spicy enough for me so they gave me a side of the habanero sauce. This was the hottest sauce I'd ever had and I loved it! They were served with beans and rice -- both were vegan and very tasty. It was a fairly satisfying dinner. There was also a grilled hot poblano pepper, which was really good. At the end of our meal, we really wanted something sweet, but, of course, none of the desserts were vegan. There was, however, a dessert wine that sounded wonderful so we got that. 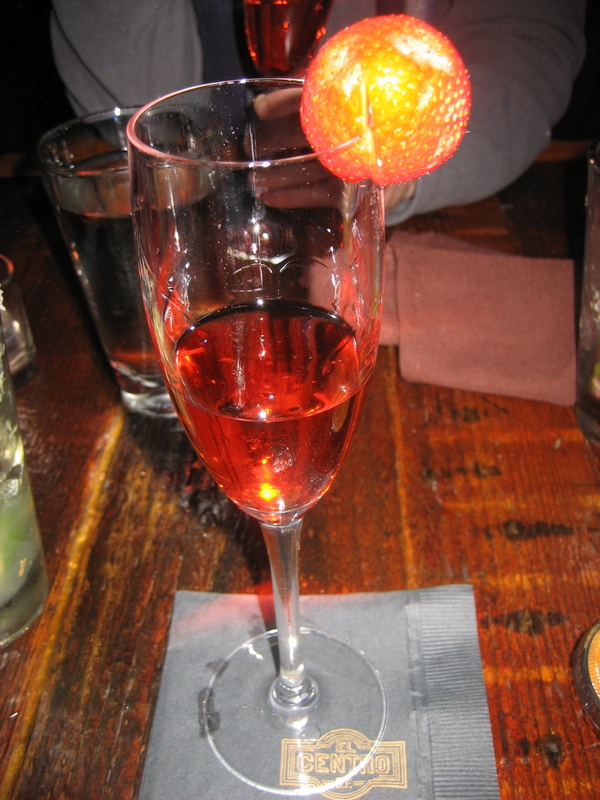 It was an almond tequila with cacao and strawberries and was marvelous! All in all, I enjoyed eating at El Centro D.F. The atmosphere is great and the venue is unique. I think for what they have, some of it is reasonably priced, but some of it is pretty pricey. The nopal tacos were only $11 and the mushroom huaraches were $10. I only wish they had more vegan options. I think next time I'll just go back for drinks and chips with guacamole -- happy hour style.